is designed to help people manage a fixed budget on a weekly, fortnightly or monthly basis. Synchronise across all devices using the cloud. Add a new expense by tapping the ‘+’ icon. All the categories are user defined, structure your spending as you like. If you need an entire category for shoes, you’ve got it. Use settings to define the budget amount and the expense period and start date. 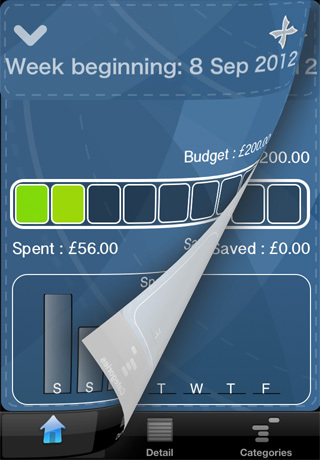 Once expenses have been entered, tap a category on the main screen to view all the expenses made in the current period.